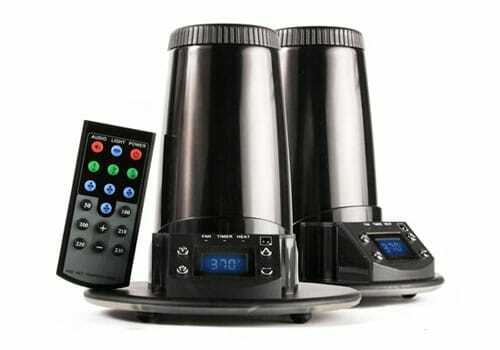 Have you been longing for the Volcano, but aren't willing to fork over $500-$600 for a vaporizer? The Arizer Extreme Q Vaporizer has been tested by our seasoned cannabis enthusiasts and we believe that this digital, remote-controlled vapor tower is just as good as the much more expensive Volcano vaporizer system. The Arizer Extreme Q can be used interchangeably as a bag-inhale system or as a direct-inhale system by switching the connector piece. Get the lung-saving goodness of a real vaporizer without digging into your life savings! As a cannabis lover, I have dreamed of getting a Volcano vaporizer but could never get myself to put down that much money at once for a device that was just going to be used to consume cannabis. I actually heard about the Arizer Extreme Q from a friend who works in a dispensary. While still pretty pricey, this Arizer is much, much cheaper than the Volcano so at first I was afraid that there would be some sort of catch. Despite my initial hesitation, I finally ended up purchasing one after I saw a demonstration of one at a friend's house. I have been worrying about putting too much smoke in my lungs and I figured that $190 was nothing compared to my health. I wanted to share my full review of this cheaper Volcano alternative. When I got my Arizer Extreme Q Vaporizer, it was sturdily packaged with clear instructions on how to operate it properly to get the best results. It was easy to switch back and forth between the bag and tube connector, allowing the vaporizer to either fill a bag with vaporized THC or the vapor can be breathed directly into the lungs through a tube. If you do go with the Arizer, make sure you get bags so you can use it as a bagged vaporizer. This allows you to fill a whole bag with vapor, and pass it around, which makes it ultra-convenient. The best part of vaporizing is the fact that it's almost impossible to burn your throat. Because there's no combustion, there's no smoke, which is much healthier for your lungs. With vaporizing, there's pretty much no known negatives to using medical marijuana. While the vaporizer doesn't hit me quite as hard as a bong, I was surprised at both how well the vapor worked and how little cannabis was needed to get me where I wanted to go. When using my Arizer, I use less buds to get the same amount of effect as a bong, though it does take longer since the vaporizer must be warmed up and the bags filled with vapor. Whenever I breathe in the THC vapor, it seems just like I'm breathing air with a slight after-taste of cannabis. The first time I used the vaporizer, I remember inhaling a few times and thinking, "This isn't working… is it working? I don't think it's working…" then all of a sudden–BAM!– it hit me like a bag a bricks! Overall, I have been really pleased with my purchase and would do it again in a heart-beat. The Arizer Extreme Q Vaporizer will impress your friends, is gentle enough to be used by cannabis newbies or medical marijuana patients, and will get you medicated.